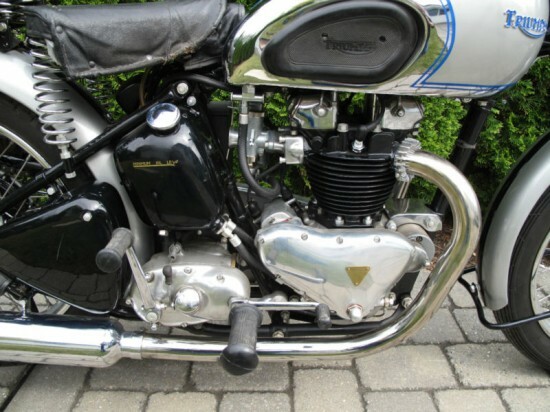 As many of you repeat readers may know, I have a thing for Triumphs, and more specifically rigid pre-unit Triumphs. What has changed in the last few months is that I have read a great history/biography/tell all book by Bert Hopwood; What Ever happened to the British Motorcycle Industry. It is a book that tells the history of manufactures such as Ariel, Triumph, BSA and Norton from a person that worked at all of them, Bert Hopwood. What it also does is do a lot of self promotion by Bert and gossiping about Edward Turner. 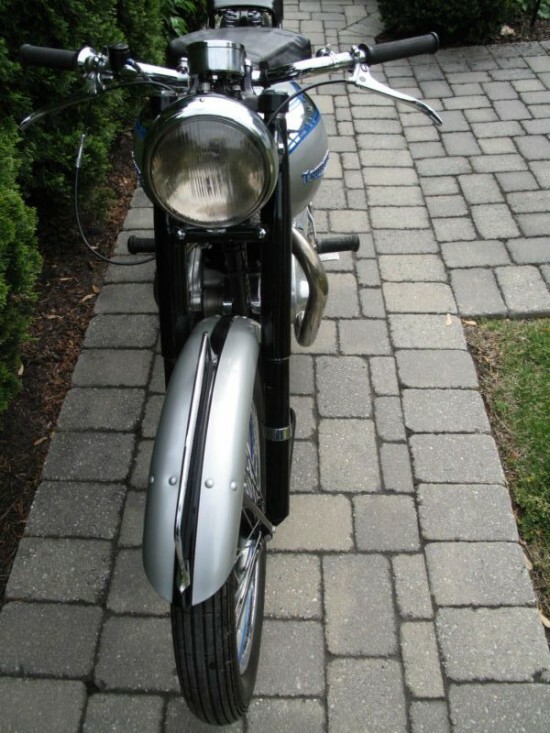 With this new information, looking at this 1947 T100 Tiger offered up on eBay now looks a little bit different. 1947 T100 OLDER RESTORATION CAME FROMAUSTRALIA. 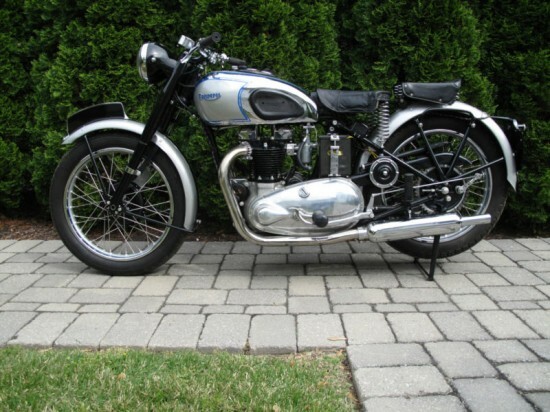 SUPERB EXAMPLE OF A 1947 T100, GONE OVER COMPLETELY, NEW AMAL 276 SERIES CARB, BIKE STARTS FIRST KICK RUNS GREAT. WOULD MAKE SOMEONE A GREAT INVESTMENT. THESE BIKES ARE GETTING HARD TO FIND IN GOOD CONDITION. 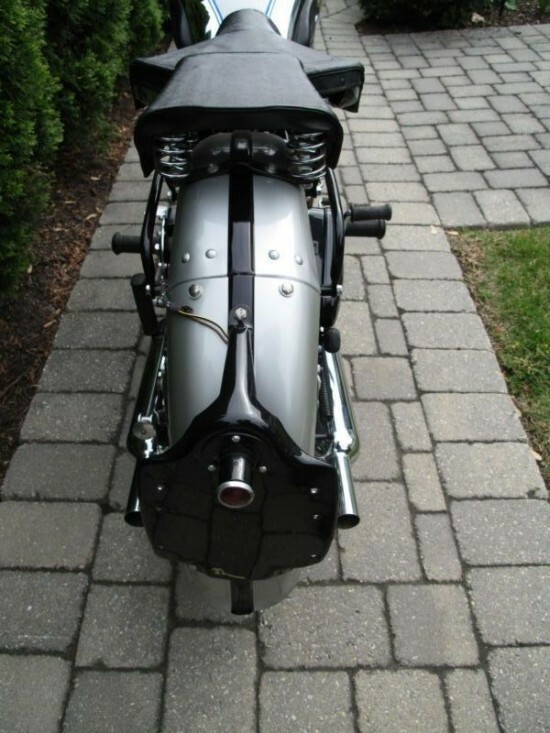 BIKE HAS A CLEAR NEWJERSEYTITLE AND ALSO HAS AUSTRALIAN TITLE WORK DONT MISS THIS OPERTUNITY TO OWN A OLD TRIUMPH. Edward Turner had moved to Triumph from Ariel, replacing Val Page as the General Manager. When he did this he scrapped the Page designed 6/1 twin and started with a fresh piece of paper to develop the Speed Twin. With its success, in 1939 the Tiger T100 was offered to the public. 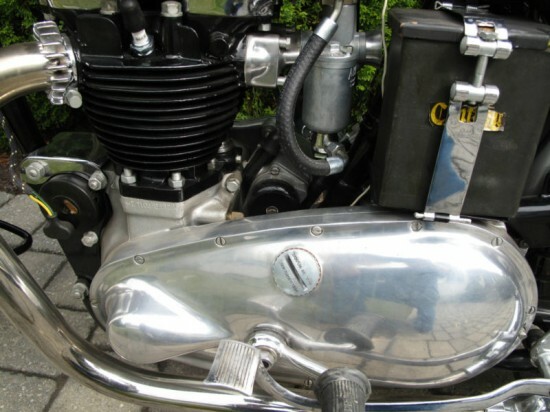 Offering 26bhp at 6300rpm, the 100 in T100 was for the top speed of 100mph. Bert Hopwood was the draftsman for Turner at this time, and according to Hopwood, Turner had great ideas, but lacked in the technical background to make it work. Toot Toot to from Hopwood. 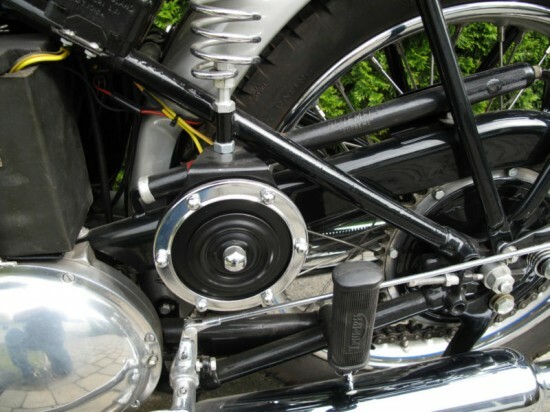 With frame design just a few steps away from bicycles, the T100 had a rigid rear end until 1953, not helping design the war stopped production from 1941 until 1946. The front end did have springs, and hydraulic dampening, but may have had some design elements borrowed from a certain German manufacture.